Can I Safely Open a File That Contains "Macros?" 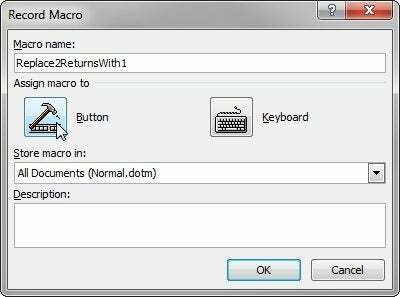 Ronald Albaitis tried opening a file and got a warning that it contained "macros." He asked me what they are and whether he should be concerned. A macro is a small, usually user-created piece of programming that runs inside another, larger program. Several applications come with macro-writing and -running capabilities. For instance, several Microsoft Office programs use a macro language called Visual Basic for Applications (VBA). I've used it to create a considerable number of macros in Word. One of them, which runs when I press CTRL-w, waits for me to press a character key, then deletes all of the text between the insertion point and the next instant of that character. Word's Macro Recorder, which follows my actions, then automatically writes the macro. I then go into the code editor and fiddle with it a bit. Macros can be assigned to a particular template or document. And there, as you can guess, sits the danger. Macros are yet another place where criminals can hide malicious code. Someone sends you a .doc file, you open it, and it infects your PC. Should you enable a document's macros? Only if you know the person who sent you the file, know that there's a legitimate reason for those macros, and have a reason to use them. And even then, you want to be sure that the file really came from that person and not from someone who hijacked their email account.